Sometimes, pranks pay off. 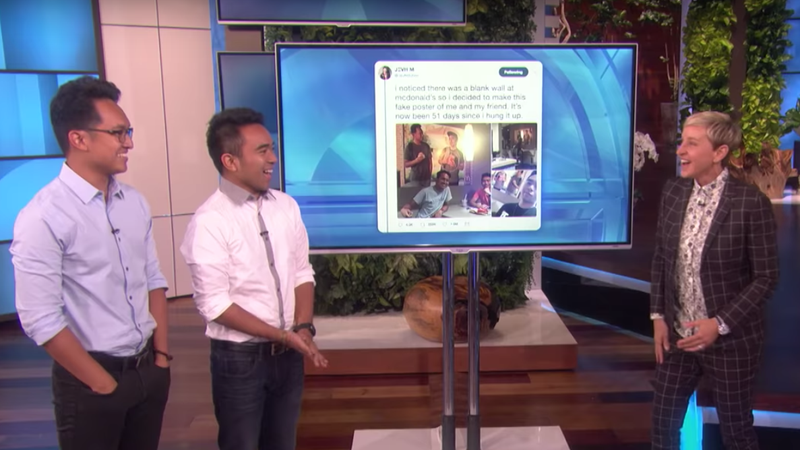 A few months back, Jevh Maravilla and Christian Toledo noticed that the photos of fun-loving people displayed at their local McDonald’s didn’t include any Asians (the friends are Filipino-American). So they took a picture of themselves using a tripod, found some McDonald’s uniforms at a thrift shop, and installed a new poster at their favorite McDonald’s (Maravilla even wore a name tag identifying him as “Regional Interior Manager”). Not only did they not getting in trouble for hanging the poster, no one even noticed it for 51 days. At the end of their story, Degeneres revealed to Maravilla and Toledo that they will be featured in an upcoming McDonald’s marketing campaign, which will highlight diversity. And they will be getting paid for that, as an Ellen staffer then ran out with two $25,000 checks for the pair. According to KHOU in Houston, McDonald’s says that the poster will be taken down because that store is being remodeled. But “the new store would reflect more of the community’s diversity,” reports NBC News. The original poster is being donated to a Ronald McDonald house. On one hand: prank. On the other hand, if you’re looking for a way to get your message across, turns out you can be pretty successful if you find a charming, non-harmful way to do it. Hey Roger Federer, is a hot dog a sandwich?